GREENFIELD -- In the copse beside the old rails, hidden by foliage falling from large oaks and birches, are the relics of drifters who have dwelt in these woods for decades: abandoned fire pits, discarded suitcases, ruined tree houses, and weathered tarps, among mounds of other detritus. Since perhaps as far back as the Great Depression, the site known as ``the jungle'' has served as a temporary home to hobos who hopped the north-south and east-west freight lines that intersect at the nearby East Deerfield Rail Yard, the state's largest depot for freight trains. 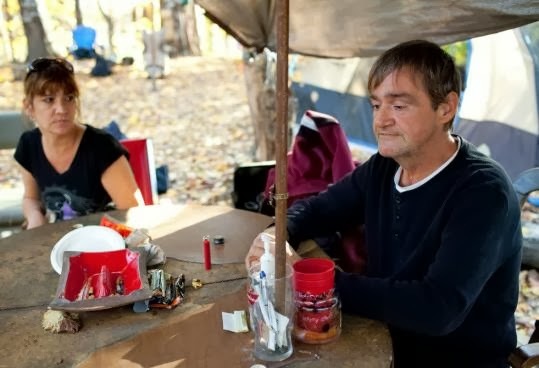 In recent years, as the economy has stagnated and the area's homeless population has grown, the woods have become home to those who prefer not to stay in overcrowded shelters. Now, after so many years of tolerating the secluded encampments a short walk from the historic downtown, officials in this 257-year-old city have decided to do away with what they consider an eyesore and a potential trouble spot. Citing a burgeoning population in the woods and $90 million in new railway investments from the company that owns the tracks, they have vowed to sweep the area of its remaining inhabitants and cut as many trees as possible to make it less appealing to dwellers. Local authorities told the residents this week that their tents would be torn down and that bulldozers would move in as soon as today. The eviction threat has devastated the remaining residents of the jungle, whose numbers range from four to 40, depending on the time of year. They call the small clearing in the woods home and have erected tents and lounge chairs, brought in grills and coolers, built a modest dining room with a large table and mismatched chairs, and added accoutrements such as Halloween decorations, a Christmas tree, and a ``Do Not Disturb'' door hanger. On a recent afternoon, seven men and one woman sat beneath a tarp hanging over their dining room, recalling the history of their settlement and accusing authorities of breaking up a family and banishing them to more dangerous places, such as street alleys. They said they keep to themselves, take care of the area, and look after one another, sharing food, clothing, and their highs and lows. City officials and social workers said they are trying to help the jungle's residents find permanent, affordable housing. They said as many as 30 new units would be available in Greenfield in the next month or two, but they acknowledged it might be difficult for the homeless to qualify for the housing and that there is a long list of other people already seeking the new homes. For the time being, those who live in the jungle are all being offered transportation to emergency shelters in nearby Turners Falls and Northampton, both of which are already filled every night and have waiting lists. But like a lot of homeless people, they prefer the outdoors, even in the cold, to shelters, where there are often not enough beds and which they consider unsafe. Greenfield Police Chief David Guilbault said authorities have rarely had serious problems with residents of the jungle, most of whom are well known in town. More recently, he said the area has attracted younger people and underage drinking, and he said he is concerned about the mounting refuse. Over the summer, a man visiting the area suffered a serious head injury after another visitor assaulted him with a block of wood. Officials at Pan Am Railways, which owns the land and is pouring money into repairing the tracks and surrounding infrastructure, began posting ``no trespassing'' signs in the area several weeks ago. Their police have made occasional arrests there over the years, though they have not had serious problems. But with their new investment, which will allow trains to reach faster speeds, they and city officials say they want to ensure that no one gets hurt. ``The railroad is a dangerous place, and we've always frowned on trespassers,'' said Cynthia Scarano, executive vice president of Pan Am Railways, based in North Billerica, adding she has sought bids from loggers about clear-cutting the area. The pressure to find housing for those who will be displaced has fallen on Rick Willhite, director of the housing program at ServiceNet, a local provider of homeless services. Martin also told him he wants them out before the cold arrives, leaving Willhite in a bind. He said he was as surprised to learn of the imminent arrival of the bulldozers as the homeless. He has arranged for them to be housed in emergency shelters, but he has yet to find a long-term solution. Willhite expects that some residents of the jungle will accept living in shelters, while others eventually resume living outdoors. ``Unfortunately, the real solution, permanent housing, won't happen as fast as we or they would like,'' he said. Despite the notice residents said they received from the company's police that they would be ousted today, Scarano said they are still waiting for approval from the city before taking action. ``We want to make sure the people get help,'' she said. The jungle's residents said they don't know whom to believe. After three years living there, Jay Scarborough, 49, who volunteers at the local Salvation Army and works construction jobs when he can get them, is livid about the treatment he and his friends are receiving. He said he rakes the leaves in the fall and shovels the snow in the winter. He makes sure everyone has enough warm blankets and clothes and shares food with other residents.